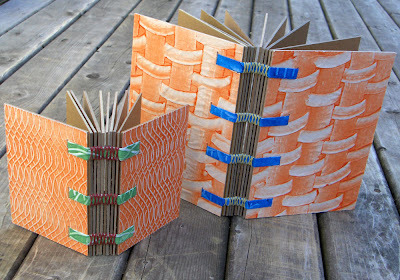 Books made from cardboard. Yeah, the purist bookbinders will cringe. These aren't exactly archival. They are just fun notebooks - not everything needs to last forever. 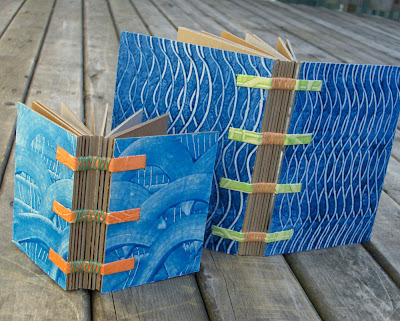 You see, for a lot of my handmade journals, I use paper from large sketchpads for the pages. Each time I finish with one of these sketchpads, I'm left with the large cardboard sheet from the back. 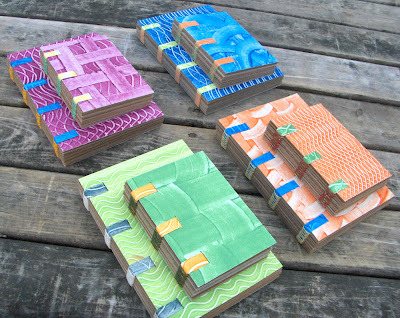 So once I accumulate a stack of them, I cut them up and turn them into these cardboard books. It makes sense to me. I have found that paste papers look great on these. My paste papers are obviously really basic, nothing fancy, and so I think they suit these books rather well. Making cardboard books gives me an excuse to make paste papers. These are bound using one of the stitching techniques described by Smith in his book Sewing Single Sheets. There are folded strips of paste paper used as sewing supports, and sewing creates small Xs along the spine. My stack of cardboard was almost to the ceiling when I started on these so I have lots of them, for sale on Artfire and Etsy. I think these are great! I love the idea of using the cardboard from the large paper pads once the pad is used up. No, I don't think there is much room for growth in these particular books; however, I have thought about that and envisioned a way of making it possible. By adhering a narrow strip of card to the spine edge of each sheet before binding, that would create enough space inside the book for attaching various flat items. thank you Cynnie. and yes, i have the cutest assistant for sure! I think these are great! Love your paste papers too much fantastic. Great idea. I would love to see a tutorial on this!